MENTOR- If you should be searching for Carol Snively, don’t start at her home. “I’m not home a lot,” said the 78-year-young community volunteer. Mondays, Wednesdays, and Fridays she instructs chair volleyball at the Mentor Senior Center. Tuesdays she helps with an afternoon wood-carving class. One Friday a month she leads the prayer for the center’s monthly birthday luncheon. That’s only the Mentor Senior Center. She also volunteers with Mentor United Methodist Church, Holden Arboretum, and takes photographs for RSVP and Frank Krupa. Time with her chair volleyball group has proven therapeutic for Snively. “This has been a sanctuary for me after my husband passed away,” she said. (Her husband of 56-plus years, Richard, passed away March 16, 2016). “Chair volleyball is like a family for me. One of her joys is to see a shy person become more comfortable as he/she spends time with the chair volleyball group. Such a person might start as a quiet participant, then evolve into someone happily keeping score. Chair volleyball started at the Mentor Senior Center about seven years ago. 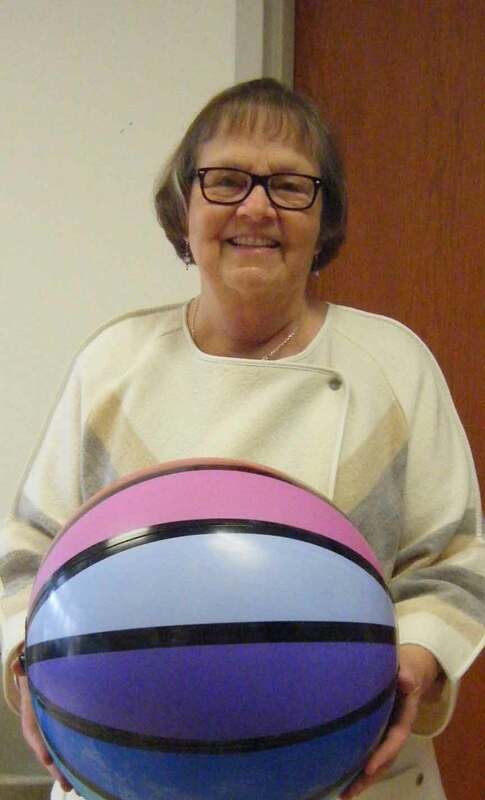 Although chair volleyball takes much of her time at the senior center, she was lured to join the center 12 years ago because of a wood-carving class. She also enjoys crafting the birthday luncheon prayers, as she approaches it with a non-traditional twist. “I enjoy it. Instead of a grace I like to do a story,” she said. For her church’s annual Thanksgiving dinner, Snively cuts pies and greets guests. The church has served up to 1,000 dinners, including both those eating in and those delivered to shut-ins. After the post office has collected food, she picks it up for the church food pantry. In the past, she has conducted pond and forest studies with children at Holden Arboretum. Currently she assists the agency with fundraisers by serving beverages at meal venues. She met RSVP Director Cristen Kane when the agency visited the senior center. One thing led to another and she began volunteering for the organization. In 2016 RSVP named Snively Volunteer of the Year. She still assists the agency at least once a month, often taking photos of events. She also photographs productions for Frank Kupra, who performs and directs productions at the senior center, Wildwood, and other area venues. The Pennsylvania native moved to Mentor when her husband decided to find another job. Her family expanded to four children, and she began volunteering in the 1960s as first her daughters joined Brownies, then her sons joined Cub Scouts. Peppered within rearing a family and volunteering, Snively also worked part time outside the home selling diamonds at J.B. Robinson at the Great Lakes Mall for 14 years, and as office manager/secretary for Joseph A. Oliverio, licensed physical therapist, for 24 years. “I step in anywhere, wherever there is a need,” she said. Volunteer Carol Snively enjoys chair volleyball at the Mentor Senior Center. Chair volleyball allows the fun of the game without the fear of falling, as all participants must remain in their seats, she said.